Custom imprint drink tokens with your design and copy, or choose from our stock designs. Our minimum order is 500 tokens. Volume discounts are available. Delivery time is 2 -3 weeks. Quick print/delivery is available. You can use tokens for promotional incentives, economy key chains, bar drink tokens, pizzeria/restaurant chips, towel and hat checks, meal and ride tokens, bottle returns, bus and parking tokens, game schedules, admission tokens, check cashing, and lottery scratchers. 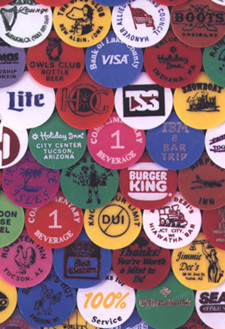 Plastic tokens are a great promotional tool for bars, lounges, and restaurants; insurance and real estate agencies; schools; auto dealers; hospitals; clubs and organizations; credit unions; retail stores; conventions and fairs; banks & savings and loans; grocery stores; and shopping centers. Add 13¢ per Token (design on one side and Consecutive Numbers only on other side). 9¢ per token for Holes only; 13¢ per token for Holes and 1 side imprint; 17¢ per token for Holes and 2 side imprint.